Starting from volume 26 (year 2007) Geochronometria is available on Sciendo platform. Volumes 38-41 (years 2011-2014) are also available on SpringerLink platform. Manuscripts should be submitted online through the Editorial Manager. The list of indexing services is available at Sciendo website. On behalf of the Editors of Geochronometria and De Gruyter Open I am pleased to inform you that Geochronometria is becoming open access, which means freely available to everyone, anywhere in the world and it will be distributed by De Gruyter Open. In the past years of successful publication of this journal, we have been striving for increasing quality which is reflected by the current impact factor of 1.243 (5-year 1.268). This was possible due to the contribution from our authors and referees who we are grateful to. We will continue to work towards increasing quality of Geochronometria with your help. Publication of a peer-reviewed and open access journal is not without costs. These expenses will be covered by Article Processing Charges, which are paid by the author's funder, sponsor or affiliated institution (for details see http://degruyteropen.com/you/author/fundingforauthors/). Manuscripts accepted for publication in Geochronometria will be subject to Article Processing Charge of 1000 EUR (plus VAT where applicable). However, it is important to remember that authors from countries where no such funding schemes are in place will be given the opportunity to apply for waivers (http://degruyteropen.com/de-gruyter-open-apcs-and-bpcs-waiver-and-discount-policy/ ). Geochronometria is aimed at integrating scientists developing different methods of absolute chronology and using them in different fields of earth and other natural sciences and archaeology. The methods in use are physical (e.g. radiocarbon and other isotopic methods, luminescence etc.) as well as non-physical (e.g. dendrochronology or varve chronology), and they are used in so diverse fields of science as geology, palaeoclimatology, palaeobiology, palaeohydrology, archaeology, etc.. Each method can be applied in many fields, and vice versa, each field can benefit from application of many chronological methods. The journal enables an easy exchange of information about the potential and limitations of various chronological methods to solve specific problems in various branches of science, and stimulates formulation of new ideas on their further development and application. In the sense of classical division of sciences, Geochronometria is multidisciplinary and in fact, interdisciplinarity is quite a common feature of most modern research dealing with methods of absolute chronology. Geochronometria publishes papers that are concerned with all methods of absolute dating. Papers focusing both on techniques/methodology and on applications of dating are equally encouraged. Papers combining and comparing results of various methods are especially desirable. 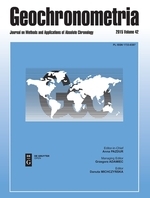 Language editing of papers published in Geochronometria in 2018 was financed by a grant by the Polish Ministry of Science and Higher Education.